Ver-o-Peso is part of the Tentative list of Brazil in order to qualify for inclusion in the World Heritage List. In August 2018, I visited Belém, the capital of the Brazilian state of Pará. I stayed in the city center, a short walk to the Ver-o-peso market, where enormous freshwater fish from the Amazon are sold. In the outdoor areas surrounding the gothic fish market, shopkeepers offer açaí berries, fruits and vegetables, and Brazil nuts, and at least one resplendent vendor was peddling love potions and get-rich-quick elixirs. For me the most important when going to Ver-o-Peso is to understand it is a mix of open air spaces and buildings, like a small district. I don't know which exactly is the proposed heritage area for this tentative site, but the protected area by the Brazilian Institute of Heritage (IPHAN) comprises Boulevard Castilhos França, the dock, the Fish Market (also known as Iron Market), the Municipal Market (also known as Meat Market), the Açaí market, the Clock Square, the Dom Pedro II Square, and Ladeira do Castelo street. It's a big area, and I didn't visit the Dom Pedro II square, and the açaí market, an open air space for selling only a very popular local fruit named açaí. The major fair area is along Boulevard Castilhos França, in an open space with a tensile fabric roof, and there you can find things like fruits, spices, sauces, general food, some small animals alive, essences and natural medicines. The diversity of products there is impressive. I have to say the fabric roof is not very appealing, and I think they could find a better solution for protecting the area. I don't know how old this structure is, but it seems new, just dirty. In the middle of this fair, you can see the Solar da Beira, a nice and colorful colonial building but with a poor state of conservation. Now it has no use, you can just use the bathrooms there. In the end of Boulevard Castilhos França, by the side of the dock, stands the Fish Market, the best well know building of Ver-o-Peso. It's a metallic structure, built in 1901. It sells fish, so don´t expect a good smell inside. Go there early in the morning if you have any interest in checking the local kind of fishes. 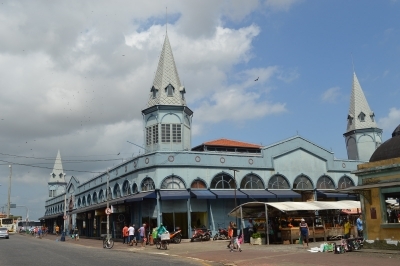 For me the nicest place was the Municipal Market, in front of Solar da Beira, the other side of the Boulevard. 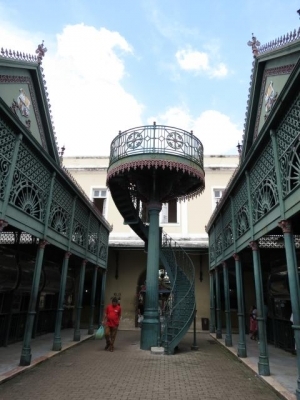 It's a big colonial building of XIX century, with a courtyard where was built iron pavilions, in 1908. They have a delicate decorative iron work, unexpected for a place that sells meat. The Clock Square, or Siqueira Campos Square, is near the dock, but it has no open air fair, so I don´t understand much why it's a part of Ver-o-Peso. It's a nice square, with a colorful row of colonial buildings surrounding it, but I didn't feel it's a very safe place. My general impression is that Ver-o-Peso, despite being the major attraction of the city, isn't a very touristic place. I saw a lot of people there, but local people, in their everyday life. I was happy to see there's no gentrification of the area, but it needs a better conservation. Also the whole place seems to be not very safe, as I was warned by one of the sellers of the open air fair to keep my camera in my bag. But I did take some pics and I had no problems there. About the value of the site as WHS, it makes more sense to me as a landscape, and it´s interesting to see, in the nomination file, that there's no mention of historical or artistic importance of specific buildings in the justification. The main focus of the nomination is the cultural importance of the fairs, the trade of Amazon products and the relation with the river, what I think it's very peculiar there, but I can't see how the squares, for example, are related to it, so I have a concern with the possible proposed heritage area. The places along the bay and the Boulevard Castilhos França seem to have much more value, as they are a more understandable complex, with a stronger relation with the fair purpose.